I have stayed quiet about ACT. Maintaining a distance partly because I know as little about the last few months as most. But I cannot pretend that I have felt indifferent. And I write now if only to get the stuff out of my head that prevents me properly concentrating on other matters. I have never known Rodney as a bully. And I was relieved to hear Deborah Coddington say the same on NewstalkZB last night. On the other hand I did experience Stephen Franks as a bully over a matter where I chose to put personal loyalty above political expediency and was severely chastised for it. I like Stephen but was very uneasy about his appearance as Heather's 'support person'. It was Stephen who ensured that Heather was placed at number 2 on the list in 2005 to act as some sort of moderating influence or counter to Rodney at number 1. Stephen had lost the mad primary-style leadership election to Rodney and I believe the current problems go back that far - at least. Richard Prebble should carry the can for that piece of insanity. Rodney would have tried to avoid personal conflict coming to a head because I don't think he handles relationships very well. I still see him as a lone player but a very effective one. His intellect and charisma are substantial. Heather's are not. As an ACT member and candidate I was overtly loyal to Rodney. I was transparent about voting for him to lead the party and would do the same over again. Realising how deep the division went through 2005-2008, with Heather seeing herself as the only one of the two ACT MPs maintaining party "respectability", my being offered 14 on the list by Heather's clique makes more sense. Thank God it happened or I might have been embroiled in this current crisis. Because once you are an MP you can never be your own person again. I have come to the view that is it impossible to maintain integrity and avoid being compromised. That is the nature of the beast when you work with people whose motives or priorities may differ from your own. In life there are good people and there are bad people, and we are nearly all one or the other at some point. Thankfully the conflict and dramas remain private. In politics they unfold in public. Heather probably believes she was well-intentioned; working selflessly for the good of the party (leaving aside any ill-judgement shown in allowing another or others too much influence on her defence associate ministership). But she overestimated her following. Went to that classic place politicians go to when they listen only to people fawning all over them most probably. Rodney now has to put the facts on the table. Mapp should assist him. Let the court of public opinion do its work with as much objectivity as can be mustered. That's the best hope he has of salvaging his party and reputation. And I don't think salvaging is too strong a word. What's wrong with National's DPB work-testing policy? What's wrong with National's DPB work-testing policy which passed into law last night? The explicit goal of the Future Focus Bill was to " ...break the cycle of welfare dependency". 7/ National can claim to be "doing something". A little akin to fiddling while Rome burns. Transfers via tax credits to families with dependent children have become larger in value and more widespread in recent years. In 1998, an earlier form of payments, also mainly delivered via the tax system and which targeted the same groups as WFF does, went to 280,000 families, with an average annual receipt of $3,500. In 2008, WFF was received by more than 384,000 families at an average annual amount of $6,500. Over the intervening decade, the number of recipient families grew by 37% and their average receipt by 84%. Currently, a working family with three children, all aged under 13 years, would still receive some amount of WFF tax credits provided their annual income is below $106,000. And in 2009 the annual bill rose again to $2.7 billion. And now couples with children want income-splitting as well? It is no wonder we get socialist government after socialist government. I thought the drive from National was for a simpler tax system yet churning ...churns on. Simple = don't take it off them in the first place. Then we could start replacing dead-weight bureaucrats with productive workers. But no. We have companies crashing while politicians continue to debate how best to confiscate and divvy up the dough to keep themselves in their positions of power, prestige and privilege. Apparently a sole parent is starving on $517 a week. It's that wicked benefit system again. Hold on. That's equivalent to $13.79 an hour after tax working 37.5 hours a week. Would a worker who chooses to spend 57 percent of their income on rent and then struggles to make ends meet, make newspaper headlines? It isn't the benefit level that is the problem. It is living beyond means. Get a flatmate. The following is an assortment of statistics. I'll stop short of calling them facts. You will see why. 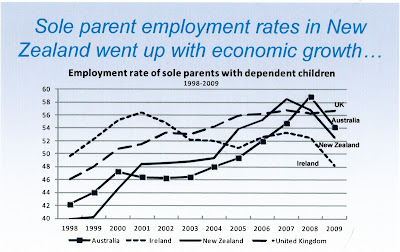 * According to the latest Household Incomes in New Zealand report the full-time employment rate for sole parents was 35% in 2009. * According to the Household Labour Force Survey, in 2009 the average employment rate for a sole parent with dependent children only was 52.5 percent. * According to Ministry of Social Development Benefit Factsheets during 2009 only 15.3 percent of people on the DPB had declared earnings (indicating they worked for all or some of the year). 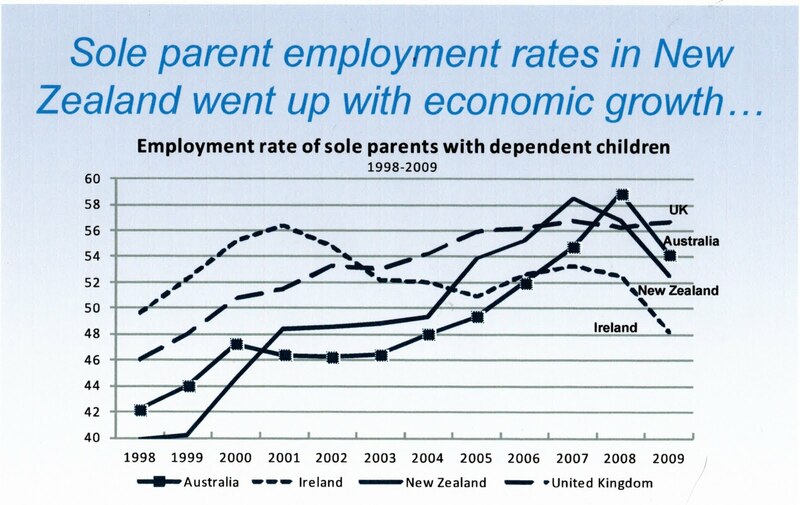 * According to the Household Incomes in New Zealand report 73% of sole parents were in receipt of a main benefit in 2009. So that means there were around 144,500 single parents. 52 percent were working; 73 percent were on a benefit and 11 percent were officially doing both. Which leaves 10 percent unofficially doing both by my calculations. (The only information I don't have is how many sole parents on benefits other than the DPB had declared earnings. At best that might add another percentage point onto the officially doing both portion). According to a recent report from Child Poverty Action Group, most DPB recipients are on the benefit for a relatively short time while their children are young, and most re-enter the workforce when their circumstances allow. What is it that is said about statistics hiding as much as they reveal? The Ministry of Social Development has just published research that finds the length of time sole parents stay on the DPB is greater than previously thought. "This finding is in line with what I have been saying for many years," said welfare commentator Lindsay Mitchell. "The real level of dependence has been masked by the short-term and often repeat stays many sole parents experience." · a third appeared to have become parents in their teenage years. "The research also finds that of the teenage sole parents who went onto the DPB (or EMA) in the year to June 1996, over half received a benefit for eight or more years of the following ten. These recipients, along with others who became parents under twenty five years of age, were categorised as 'early starters' ; over half were Maori and due to larger family size, their children accounted for 45% of the total reliant on the DPB. The early starters also had the highest benefit-debt level and uptake of special needs grants for food; were also most likely to incur a penalty for failing to name the father of their child(ren); had the highest uptake of child disability allowance and lowest level of educational qualification. "Unfortunately even the new research has limitations. For example it attempts to identify whether sole parents had become parents as teenagers by matching their age against the age of their oldest dependent child. But if the oldest child was over 18 he or she would no longer be officially dependent and would not appear in the data used." "It is a great shame the Ministry has taken so long to produce this research which is now being euphemistically described as presenting a 'more disadvantaged profile than might have been expected.' "
Mrs Mitchell concludes, "One now wonders how long it is going to take the Minister and the National government to act on it." Radical feminists (and more latterly celebrities) argue that women can ably raise children alone. Most didn't, and still don't, have the financial resources to however. Therefore those with the ability to influence or make policy were happy to swap dependence on the state for dependence on the 'patriarchal' nuclear family. Certainly some females do raise children well by themselves. We can probably all think of examples. But the evidence is that stable two-parent families provide children with, on balance, greater emotional and financial security. My own instincts have always been very pro-fathers probably for the simple reason that my own dad has been very important in my life. So it dismays me that children today are routinely deprived of their fathers and that the liberal left policy-makers refuse to join the dots. Subsiding single parents breaks down the family unit and makes men redundant. 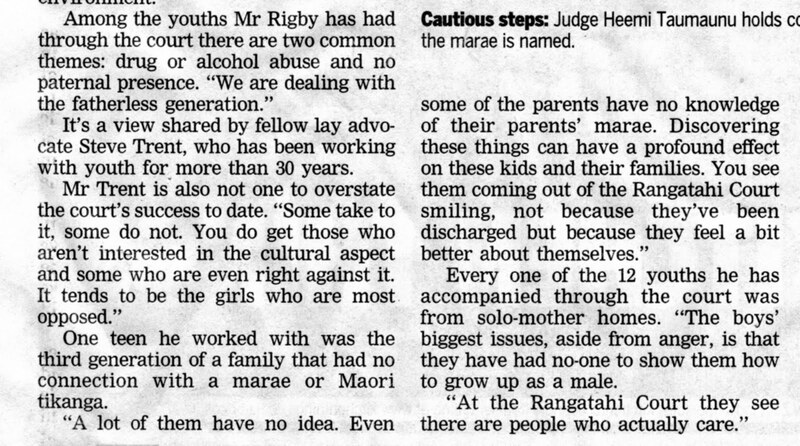 The weekend Dom Post ran an in-depth article about the marae youth courts that are becoming more numerous across the country. Unfortunately it isn't on-line. Again the observation appears about the common theme amongst kids in trouble. Instead of thinking about how the damage the DPB has caused might be undone, the state is all the time trying to deal with the consequences by introducing new family law structures and practices. The proverbial chasing the tail. That's the only word I can think of to sum up a column written by Phil Goff in today's NZ Herald (hat-tip to No Minister for pointing it out). "I'm well experienced at the skills you need to be a minister. Analysing a problem, being sure of your facts, finding solutions that work. I've done it for years and I can do it well. " Labour leader Phil Goff said that rather than a culture of long-term welfare dependency, the numbers on benefits reflected economic conditions. "It's not that people don't want to work; the jobs simply aren't there at the moment and the situation's getting worse." Great skills. Superb analysis. Yes, he has done it for years. Too many.